On Friday the very last portion of concrete was poured on the construction site of Allianz Stadion. The small portion was laid on top of the main grandstand, officially completing the concrete shell. Worth noting though, there are still some prefabs awaiting installation in the north-western corner, where access for machinery is still needed. Apart from that section all of the stands are indeed ready, so is the future office building adjoining the main stand. 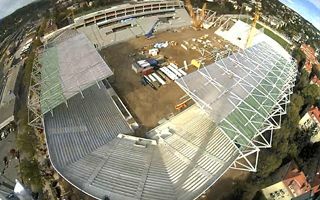 Allianz Stadion is growing extremely fast. Let’s keep in mind that back in January there were still pieces of the old stadium waiting for demolition, while now even the roof is already delivered above two stands (south and east).